Do you think you need a full day off to be able to relax? I did, up to a few weeks ago, because with an 11 month old, I wanted a whole day off ;-)! Not yet possible, but I did manage to take a few hours off and decided the perfect destination was Asmana (read our review to know some of the basics). In just a few hours, I felt refreshed and relaxed. Asmana has that power! And, from now on, I won’t hesitate to take another half day off again to recharge (am already looking at my calendar to see when I can do just that again. As a sponsor on our site, we do need to try it to know what they do, right?)! What to do in just a few hours at Asmana? If you have a chance to take a full day to relax, even better but today my goal is to convince you that even with less time on your hands, you can still get a lot out of your visit to the spa & wellness center located just outside of Florence. I’m sharing what route I took, obviously not trying to do everything at Asmana but doing the basics: warming up, sweating it out, then cooling down, enjoying strong bubbles massaging your body and treating yourself to a facial! You will enjoy the few hours of complete relaxation, letting go of all tension and anxiety which will carry you through the rest of your day… or night! (Psst: not a bad idea, they have a discount if you go after 7pm 😉 ). 1. Start with a foot bath. After checking in, changing (remember to to take along 2 large towels, robe, swimsuit and plastic slippers) and leaving the locker room area, you enter into the world of Asmana like a warm embrace, with the deeply relaxing sound of water in the background. First stop is to acclimate your body to the warmth, perfect on a cold, windy day outside. Florence, in fact, is going through a streak of record low temperatures this month and the warmth is a welcome respite, but I’m still thinking work day and the what to do’s I left behind. 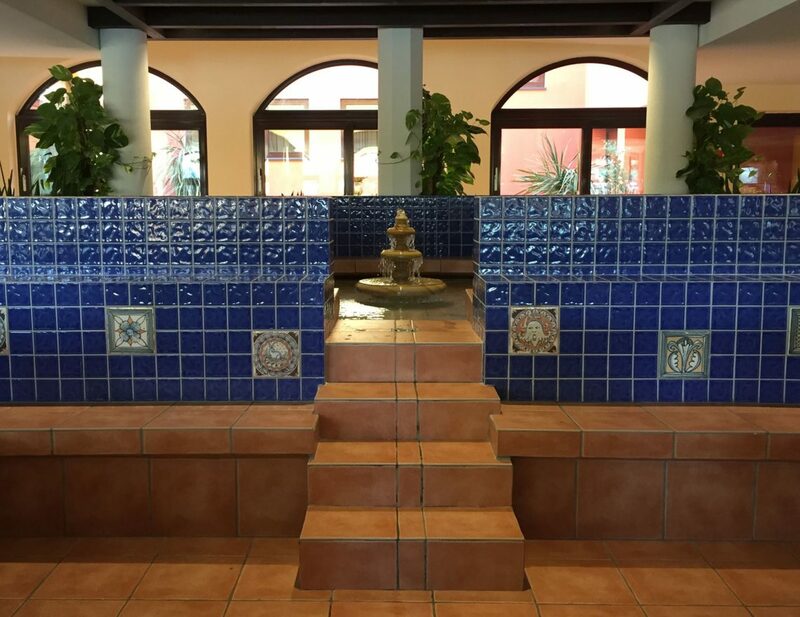 The foot bath is the perfect gateway to start warming up the body for the heated pools and saunas to come and to start letting go of wayward thoughts. The water is warm and deeply soothing, I suggest taking about 10 minutes here and getting stray thoughts out of your head. I quickly realize that while coming on my own is fine, the fact that I have no distraction for my thoughts definitely makes this transition a necessary step. Once done and before heading further in, take a look at the display by entrance near the main desk as it has the schedule for the Aufguss ceremonies in the saunas (there is one every 45 minutes). The next one is in 30 minutes which gives me a chance to get into one of the best places at Asmana, the grotta as it is called in Italian, or cave in English. 2. 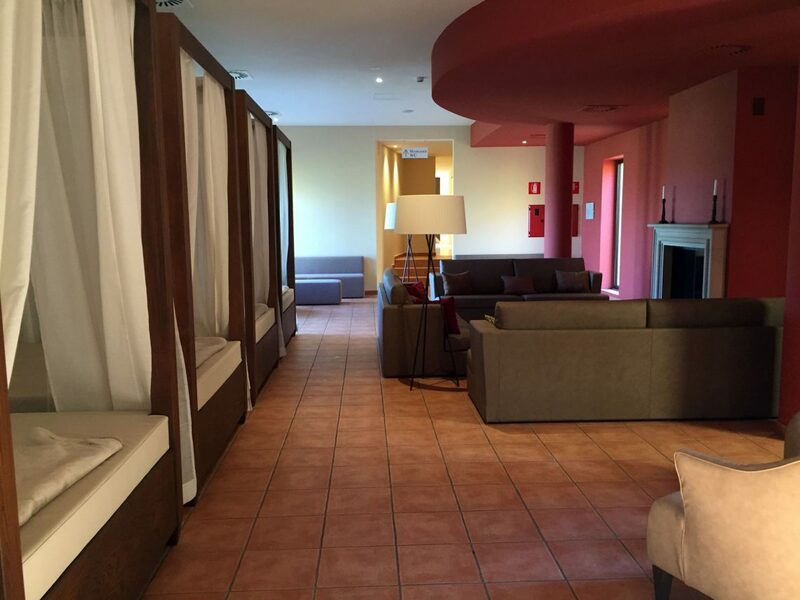 Enjoy “La Grotta” and the waterfall. The cave is one of the best places to start your itinerary at Asmana. This cavern has a bit of everything: smooth rocks at the entrance to stimulate circulation in your feet as you leave your slippers behind and walk in, warm water that wraps around and welcomes you in, one of the largest indoor waterfalls in Italy to stand or sit under to massage your back and a wading pool of knee high cold water that you walk from one end to the other and serves to quickly reactivate your circulation, known as Kneipp therapy. Then there is the color therapy, long believed to re-calibrate any imbalances in the body with the full spectrum of colors cycling through. Don’t count minutes here, just sit or stand under the waterfall and enjoy the massage. Alternate between the warm water and the cold, 2 or 3 times, to reactivate circulation in your legs and body. A look upwards at the falling water. 3. Sweat in the sauna with essential oils. These photos show you want the master of ceremonies does, but imagine the room as being very hot and with steam coming everywhere as the ice melts. Visit to see for yourself! I had a few minutes to wait until the Celtic ceremony started in the Wine Sauna, which on this cold blistery day meant I had to go outside as it is in the garden – brrrr! 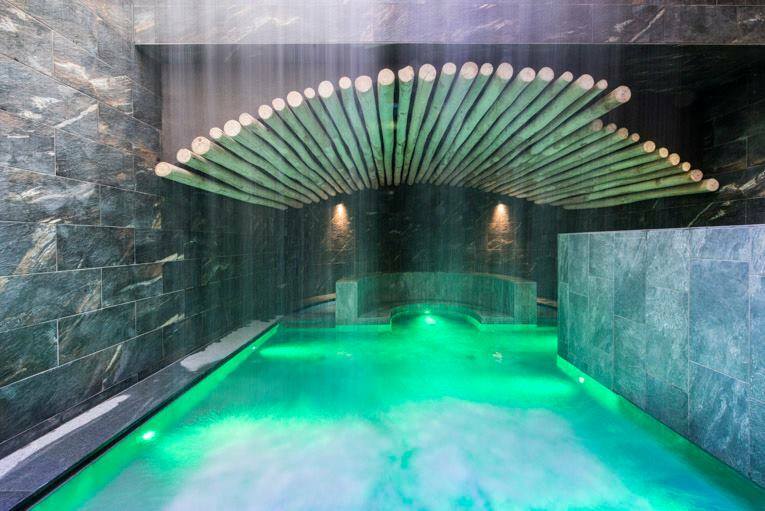 No matter, I decided to wait in the warmth of the indoor pool, letting the whirlpools continue massaging my body. I was starting to relax, with the quiet chatter of other guests in the pool in the background. I closed my eyes but realized I had to steel myself to head out to the Wine Sauna (in the photo above). 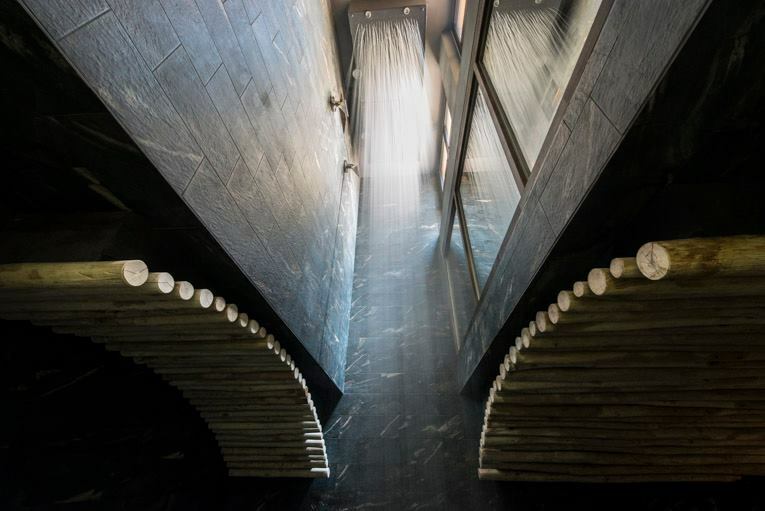 The hot air of this Finnish sauna hits you as you walk in, humidity is low at just 20% and temperature high at 80°C. I quickly take off my glasses as I realize it is too hot to wear them, and wait as others filter in while the master of ceremony gathers her necessities. This sauna is called the Wine Sauna since it is covered in oak barrels used previously to age Tuscan wine. The sauna is enjoyable at any time (recommended time is 10 minutes), but if you join in on one of the ceremonies it is a different experience. Wondering what a ceremony consists of? In essence, the master of ceremonies is a trained person in explaining the process of the sauna bath: your body heats up and sweats out impurities so it is super important that, right after the sauna, you rinse your body of the sweat (there are showers outside) and then dunk yourself into a cold water basic to bring your body temperature down. The benefits of the sauna are numerous: the heat opens up your pores and in sweating, it flushes out toxins, cleanses your skin, enhances cardiovascular function and boosts your ability to reduce stress. 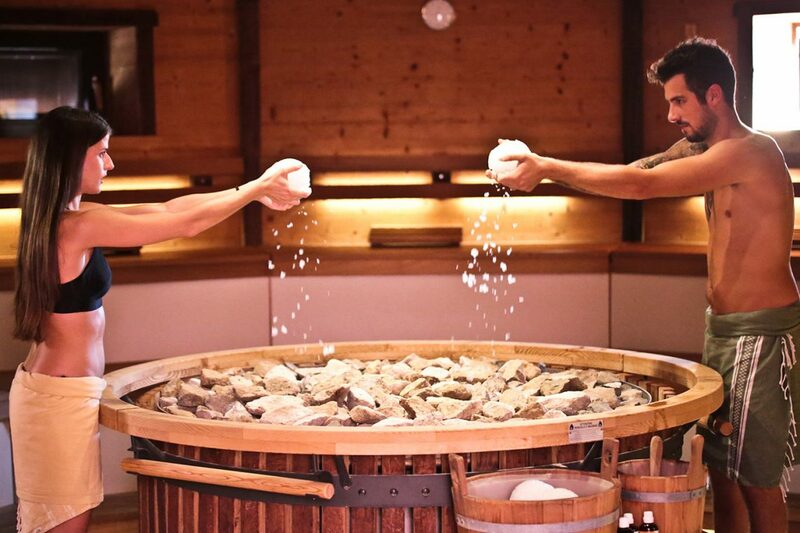 The ceremony is particularly enjoyable because the master of ceremonies places balls of ice combined with special essential oils on the hot rocks in the middle of the sauna. The ice melts and creates extra moisture, the master of ceremonies then uses a towel as she moves around the room moving the hot air around. You get waves of heated air on your face and body, pleasantly enjoying the benefits of the heat as well as the essential oils. Just as important is to close your pores after the sauna. The ceremony lasts about 10 minutes, after that you head out to the showers which are just to rinse your sweat off. The cold bath is a large basin you climb a few steps to access. As pores tighten, your blood flows back to your organs and helps your body’s natural defense system train to become stronger and respond in times of need. On this cold, windy day, I had to talk myself into doing it as it meant freezing cold water! Mamma mia, it was hard! I did the dunk in a flash, a quick in and out and was freezing and shivering in those few moments. It was worth it, I definitely had my circulation in full gear. I followed everyone back inside to the pool bar to enjoy the warm herbal infusion that Asmana offers after each ceremony to restore lost minerals and electrolytes. Want an extra boost of vitamins and minerals? Order a green smoothie to restore potassium, calcium and magnesium. Read more about the wellness cereonies on Asmana’s website. 4. Massage and warmth in the heated pools. Naturally after the dunk in the cold freezing water the next step is to warm up again. 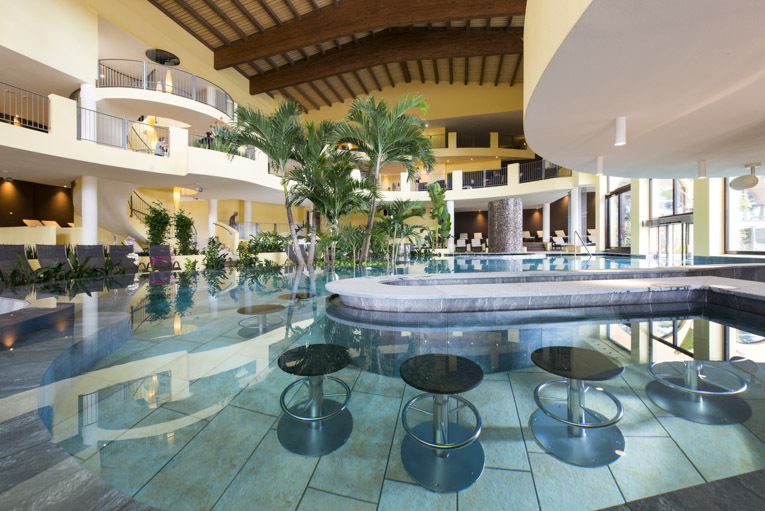 The heated indoor pool is perfect, but so are the outdoor pools, which are of course also heated! On this cold day, the outdoor pools were particularly magical with mist hanging right over the water as the cold air met the warm water. I am not sure how long I was in here, moving around between the indoor whirlpools, the outdoor ones and the saline pool. On a cold day, it felt particularly lavish to hang out in the warm water. I suggest you do the same for as long as you want, unless you have a commitment elsewhere that makes it necessary to get out and moving along. 5. A mini beauty treatment, a nap and you’re done! This is obviously not me! This is to give you an idea of the clay mask you enjoy while sitting and enjoying the warm foot bath. An excellent way to complete your time at Asmana is to treat your skin to a short, do-it-yourself beauty treatment. Go back to the desk at the entrance and there you can choose from a simple facial that includes a clay mask and moisturizer (made with aloe vera and yogurt) called “Morbida Armonia” (soft harmony) or a facial scrub with moisturizer called “Dolce Carezza” (sweet caress). If you want a little more, as I did, go with the complete treatment called “Fresco Incanto” (fresh enchantment, I love these names!) which includes the Morbida Armonia facial (clay mask and moisturizer) plus a natural balsamic balm with thyme to spread on your chest to open up your lungs, an arnica and pinewood gel to revitalize your legs and a hot herbal infusion to conclude the mini beauty treatment (about 20 minutes to do it all). You apply the treatments yourself and then sit and enjoy the foot bath while waiting for the clay mask to dry. After completing the various steps, I found myself with tingly, refreshed legs, a clear nose and the softest facial skin imaginable! I went to a nearby chaise lounge to sip my tea and admire the view of the pools outside. It was a perfect way to end my morning break, although I would recommend a nap is the natural conclusion to these few hours away from your daily routine. There are countless beds and lounge chairs spread out on the top floor of Asmana in rooms such as the one below (the fireplace room) that beckon people to take naps. Alas, I needed to get moving so I just enjoyed some quiet time before heading back to get dressed. So here you have it, what might seem like not enough time at first actually ends up being enough. If you visit in the morning, you are ready to tackle the rest of the day with a serene mind and relaxed body. If you visit in the evening, you can head home and right into bed for sweet dreams! Ready to head to Asmana? Remember to download and take along our voucher to get 10% off your visit! Want to check out all that Asmana offers? Read our review and also visit their website.